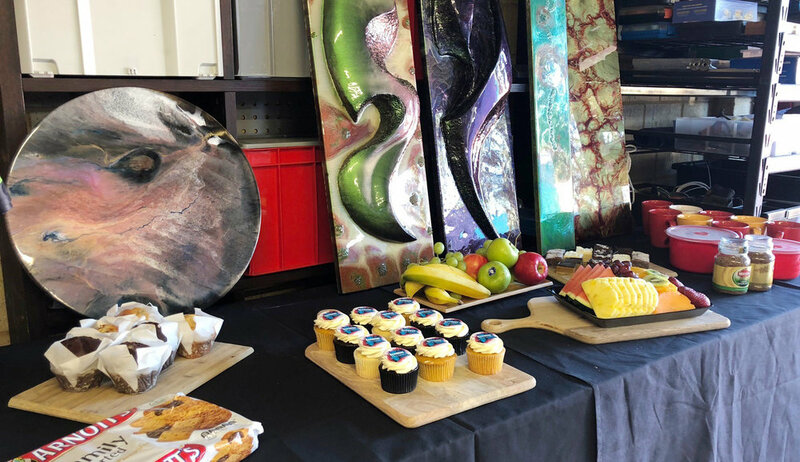 All workshops take place in our COStudio in Bassendean, Perth. All materials & products are supplied for you, just bring your imagination and get ready to learn. Class sizes are limited to no more than 8 people to ensure everyone has a chance to have one on one time. Our workshops are presented by the very talented Will Huntley who is internationally acclaimed with over 25 years in the industry travelling across Australia & New Zealand to teach. The most comprehensive workshop of its kind! For a full 5 hours you will learn techniques, tips and tricks as well as the secrets to achieving the perfect gloss finish to your artworks. During our time together, I will explain everything about the products and the process. I will also give you multiple ways to apply the product to achieve different results, using a myriad of different pigments, dyes and powders. You will also hear about what is possible and what others are creating with Resin Art. Most attendees create 3 or 4 pieces ranging from 100mm wide up to 400mm wide. But there is no rush and everyone is encouraged to go at their own pace. Everything is supplied, all you need to bring is your imagination and a willingness to learn! Learn the Art of the "Dirty Pour" with the Acrylic Pouring Workshop! For 3 full hours you will learn techniques such as the "Dirty Pour" and the secrets to creating cells and magnificent artworks! You will also hear about what is possible and what others are creating with Acrylic Pouring Art. Most attendees create 2 to 3 pieces ranging from 100mm wide up to 400mm wide. But there is no rush and everyone is encouraged to go at their own pace. Everything is supplied. All you need to bring is your imagination and a willingness to learn!